The Jeep Renegade. Jeep is set to become the world's only brand of the Fiat-Chrysler Group FCA. Also the American he founded great hopes on his Renegade. Treated in detail, as we have seen, it may capsize hearts on a segment in vogue. With the Juke, Nissan has met with success, despite (or thanks to) a very original style. 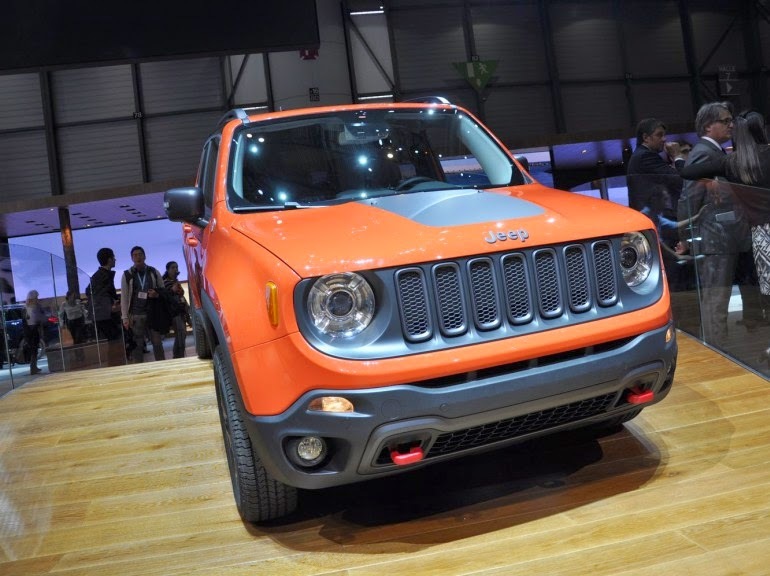 Jeep hopes to follow the path with his Renegade, which also put him on a very personal look. This small crossover does not appear necessarily graceful picture. Volume, however, everything works out: the door to front overhang seems disproportionate to the clichés ultimately proves to be nicely integrated into the width of the wing. It is the same height ratio (1.69 m) / width (1.80 m), which actually has nothing shocking, just as the sides we could have feared too vertical. Very cubic style Renegade appreciates more in detail. The many raw plastic elements reinforce the appearance of the fighter craft, in accordance with the philosophy of the brand. The immutable seven-slot grille is customizable, including available in black or gray with a chrome surround. We also appreciate the cleverly integrated taillights, with a transparent central part in a cross which is engraved in a return to the style of the grille. Furthermore, the black paint of the roof helps identify the windscreen frame as an independent unit, recalling the foldable element of the illustrious ancestor. With this model, Jeep has therefore given the means to take the path traced by the Nissan Juke. It did no less to find its place on a segment increasingly crowded. Mention will be made in Europe Renault Captur, Peugeot 2008, Opel Mokka or Citroën C4 Cactus, waiting for the Fiat 500X technically very close to the Renegade. Still, the popularity of urban crossover is global. Reflected in the choice of Ford EcoSport for, that focuses primarily on emerging markets, particularly South America (read our test Ford EcoSport). Even the United States, yet fond of large volumes begin to taste the genre, with the Buick Encore. As the only global brand CAF Group (Fiat Chrysler Automobiles), Jeep aims to counter all these models with his Renegade. An arduous task requires a flawless product. Especially regarding the interior finish, critical point when a model poses its wheels in Europe. With a foamed plastic dashboard body and serious assemblies, the Renegade appears to have successfully entered. If we recognize the climate control handset from the Fiat 500L, this new Jeep does not forget the typical winks of the brand. We thus find the design of the grille engraved in colorful surrounds speakers. The red zone tachometer splash so no shortage of fun. Finally, if we did not find any inscription "Since 1941), it is without doubt that we did not have the time to search thoroughly. In short, the interior combines originality and quality. Better still, the exterior styling is not done at the expense of interior space. Thus, the back appears generous living space, especially at the level of headroom. The trunk of 525 liters appears at the top level of the class, given the almost reasonable length of 4.23 m. Nothing exceptional in terms of modularity, however: the seat is typically split. Unlike some competitors so it Renegade has enough stamina to be the main vehicle for a small family. A good point, since this is an important part of customers in this segment. Like its cousin the future of Fiat, the 500X, the Jeep Renegade is based on the "compact wide" platform FCA, derived from that of the Giulietta and already available to 500L and Dodge Dart. The engine delivers appears broad enough to meet the specifics of every market. In the entry level, there is the 1.6 110 hp air, resulting from the alliance between Chrysler and BMW on the edge of 2000s Europe, two petrol engines will be offered: the 1.4 MultiAir 140 bhp and 170 bhp ( particularly known on the Alfa Romeo Giulietta), both with an automatic stop-start system. Top of the range, there is the Tigershark 2.4 184 hp, reminiscent of the "World Engine", also designed in the early 2000s, in association with Mitsubishi and Hyundai. Grafted from a cylinder MultiAir, this block will not be imported to Europe. Our markets, it is indeed the Diesel which should win the majority of votes. The four-cylinder comes of course Fiat. The 1.6 JTD 120 bhp is available in entry, along with the 2.0 JTD, version 140 hp or 170 hp. This can be coupled to the optional automatic transmission ZF nine reports, as well as the 1.4 MultiAir (only four-wheel drive for the two blocks) and the Tigershark 2.4. As a two-wheel drive, it is a dual-clutch seven-speed transmission that can be chosen with the 1.4 MultiAir. All engines are available in traction, while a wet clutch AWD is optional. The Trailhawh finish receives a further system with selectable two or four-wheel drive and a high ground clearance of 20 mm (for a total of 22 cm). Traditionally lagging on-board equipment, FCA strikes a blow on the Renegade. It is possible to get all the modern safety equipment, such as lane departure warning, blind spot warning or automatic emergency braking in town. Comfort, we note the presence of a seat and heated steering wheels, automatic air conditioning or a connected navigation system with touch screen. Still, the press release mentions neither of adaptive cruise control or start and keyless entry. At first glance, the Jeep Renegade appears to have successfully entered. Its style and practicality make it an original alternative to compact. Exactly the type of product required to take out of his Jeep specialist role. Remains a question: that of the weight of this model. For now, the manufacturer has not provided any figures about this, nor for fuel consumption and CO2 emissions of various versions. The lack of offers below 110 hp, as well as the previous one 500L technically close and excessive overweight, leaving some to fear overload. At a time when PSA offers 2008 C4 Cactus around tonne for the foreseeable volume, it could indeed that Renegade exceeds 1300 kg as a two-wheel drive. Implying a race engine power and thus escalating prices. That could affect the dissemination of this model when the French (including the Renault Captur) can be satisfied easily 90 hp. Only try this Jeep Renegade will decide the issue.